Natural resources volunteers, educators, professionals, and others will be gathering in Eau Claire on March 22-24, 2018 for the Wisconsin Summit for Natural Resources Volunteers. The three-day event will bring together individuals from across the state who are involved in volunteer citizen-based monitoring, stewardship, and education efforts. Participants will share their work through oral and poster presentations, receive advanced training, and network with others who are passionate about Wisconsin’s natural resources. Those who register can participate in a number of activities including 18 workshops and more than 35 presentations, as well as, a volunteer fair. The Summit is the first joint conference of the Wisconsin Master Naturalist Program and the Wisconsin Citizen-based Monitoring Network, and is being cohosted by University of Wisconsin-Extension and the Wisconsin Department of Natural Resources. The Summit will cover topics ranging from identifying frog calls to water quality monitoring to improving access to the outdoors for individuals with disabilities. “We are excited to bring together these two groups to celebrate and build upon Wisconsin’s tradition of natural resources volunteers,” says Eva Lewandowski, Citizen-based Monitoring Coordinator at DNR. Anyone interested in natural resource volunteering, including volunteers, land managers, researchers, and project leaders are encouraged to register for the Summit. Registration is currently open, with early-bird rates ending Feb. 9, 2018 and final registration deadline of March 2, 2018. Detailed information on the event and how to register are available online at http://wiatri.net/cbm/Conference/2018/. #FlashbackFriday. 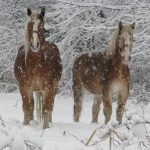 Liv Sandberg talks about riding your horse in winter – what you can do to make riding safer and what extra precautions to take during ice.